So much coming and going. Up early in the morning; many times, home late. New people and other things in the house. When you’re a dog, we think that life is built around routine. For our girls, the routine is up around 6 every morning to take care of business. . .followed by breakfast. . .followed by taking care of business. . .followed by their infamous, early morning nap! By any human account, it’s a schedule made in heaven. Food, sleep and relief and it’s all repeated in the evening. Over the past three months, the routine has been somewhat skewed. As D#1 has settled in with her dog, the routine became–well, less routine, and more like a circus. Consider that for the past 90 days, we have gotten up at our usual time to try and be as ‘routine’ as possible; however, her dog has begun to adopt our dogs’ routine hours. So, guess who gets up at the same time? Yeah. . .the only problem with this is that the puppy wants to play and our brood wants to go back to sleep. In the evening, the energy level of the puppy was so great that Jean figured out that they could have a certain amount of play time together followed by alone time. Once this plan was hatched and started, routine started becoming a reality in our house–again! Now, that D#1 and the puppy have moved to their own digs, we’re left with the 3 girls. They know something is different and are pretty sure it has to do with that DOG that had been here, but they’re not quite sure. We know that it will take a few days for them to ‘let their guard down’, but until then we’ll be watching to see if they start to get back into their routine–come to think of it, we’ll probably be up around 6 tomorrow, so we guess that all is right in the dog world! 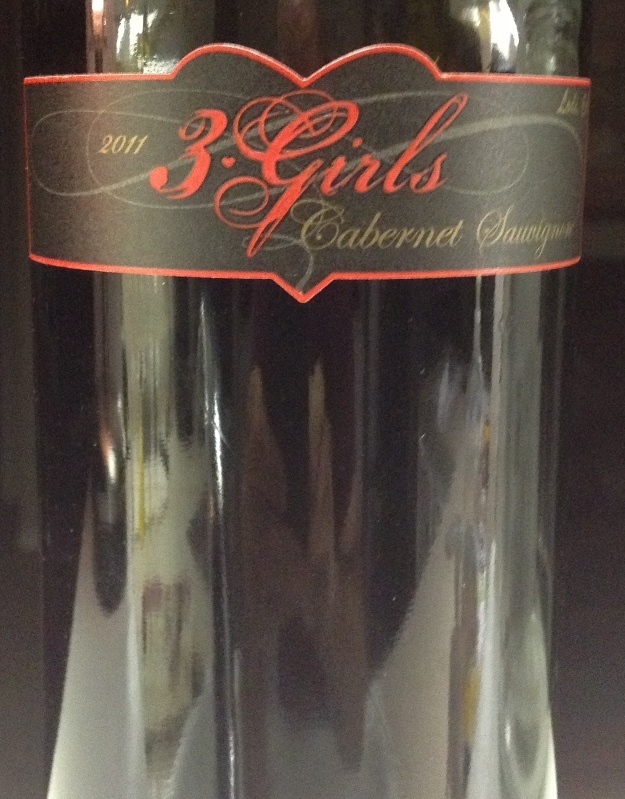 To mark the moment of returning to the three dogs, we found at World Market a 2011 3 Girls Cabernet Sauvigon from Lodi, California. It’s from a familiar place in our wine blogs, Oak Ridge Winery. This wine isn’t going to set the world on fire. It’s your basic cab–medium body, dark ruby color; earthy, tart cassis, tart plum nose; tart currant, earthy palate; medium-plus finish 87+ points—in case you missed it, it’s tart–but good. It actually rates higher than we would have thought because it’s so young. And a mass-produced wine like this typically isn’t one that you’ll cellar for 10-15 years, so buy it and try it. . .available exclusively at World Market, here’s what they say about this wine, “Ripe, dark fruit, smoke and vanilla notes add to the full-bodied sweet fruit and creamy texture of 3 Girls Cabernet Sauvignon. Sourced from Lodi, California, which is ideally situated between the Sierra Nevada foothills and the San Francisco Bay, the climate features warm days and cool evening breezes. An instant customer favorite, try it with burgers, meat-lovers pizza or simply on its own.” Priced below $10 a bottle, it’s probably worth at least a try because there are a lot of more expensive options that may not offer the taste of this wine. Our girls are exhausted. . .after their early morning nap, they had to take a mid-to-late morning nap followed closely by an afternoon nap. That was interrupted by a potty break outside and then a late afternoon/early evening nap. . .fortunately, we rescued them from the routine and they enjoyed a full dinner with chew sticks for dessert! It just doesn’t get much better than this—if you’re a dog! For us, after a day of shopping at the Outlets in San Marcos, a stop at Target, a run for some furniture shopping, stopping at D#1’s apartment and unpacking — followed by dinner at Dave & Busters—which brought back some serious memories from when the kids were growing up–for us, it’s time for “lights out”. Enjoy your favorite wine responsibly and remember to recycle whenever possible. Categories: Uncategorized | Tags: california, Dave & Buster's Cabernet Sauvignon, Lodi, Oak Ridge Winery, Outback Steakhouse, San Marcos Premium Outlets, Tanger Outlets, World Market | Permalink. Doug – would love to continue, but might have to take up a collection to do so! Thanks for reading, it has been fun!